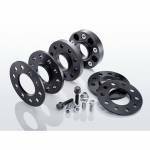 Eibach Pro-Spacers are available in a wide range of sizes letting you position your wheels exactly where they will look and perform at their best. 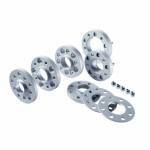 High strength alloy, much lighter than steel, Eibach Pro Spacers are precision engineered to make sure they fit your car exactly. With the Eibach Pro-Spacer installed, the car looks wider and better, as the wheel fills the arch. That's how the car's look gets its final touch. By increasing the track width, not only is the appearance improved, but you also achieve an optimised driving behaviour combined with higher stability, as the roll of the chassis is influenced positively.